Welcome to the Holiday Inn Express of Frazer - Malvern Hotel. We are located just off Route 202 at the intersection of 29 & 30 in Malvern. 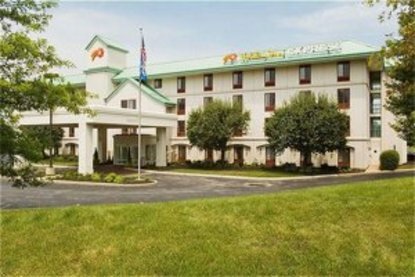 We are also only 7 miles from historic Valley Forge Park and the famous King of Prussia Mall. Close proximity to Paoli Hospital, People's Light & Theatre Company, Wyeth, Siemens, Acme, QVC and Ikon. Ideal for either leisure or business travel, our hotel offers an award winning complimentary Express Start hot breakfast bar with our signature Smart Roast coffee and cinnamon rolls, free local phone calls, complimentary USA Today newspaper, and an on-site fitness center. All our rooms offer a microwave and refrigerator, in-room coffee makers, hair dryer, iron and ironing board, high-speed Internet access, and a large work space. Whether you are traveling on business or pleasure, make the Holiday Inn of Malvern your home away from home. This hotel is committed to providing accessible facilities under the American Disabilities Act. If your accessibility needs are not met, please contact the Hotel Manager on Duty. Should you require additional information regarding accessible facilities for guests with disabilities, please call 1-800-Holiday (U.S. and Canada) or contact the hotel directly. For the hearing impaired, TDD service is available at 1-800-238-5544 within the U.S. and Canada.